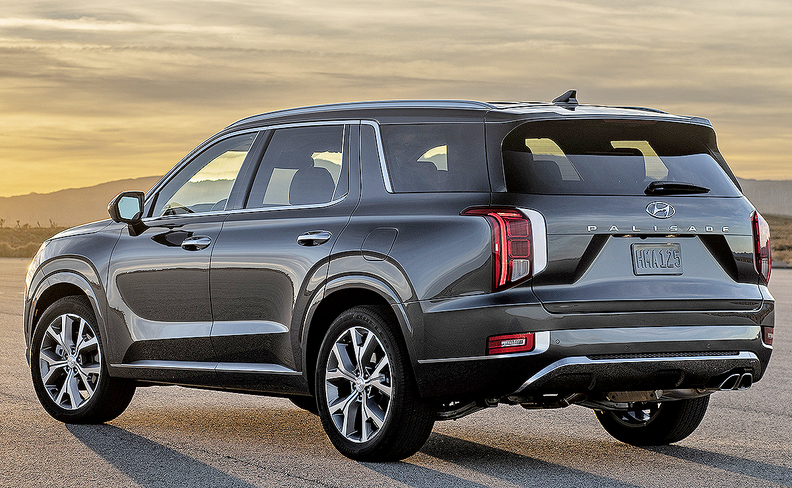 The Kia Telluride, above, and Cadillac XT6, left and top, are about to join the fray. 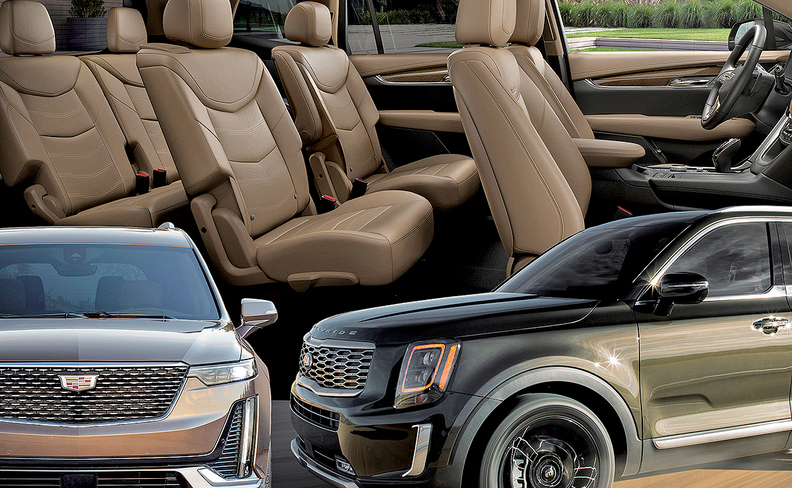 DETROIT — When the Kia Telluride concept debuted in 2016, designer Tom Kearns had a "gut feeling" that the brand had hit the right marks with the boxy creation. His gut proved correct, and last week, the production version made a rugged entrance on a hilly course at Detroit's Cobo Center in a stunt out of the Jeep playbook. Now, the Telluride must pull off another daring stunt: making its mark in a market that's already brimming with new and established three-row crossover options, from humble Chevrolet and Ford models to sumptuous ones from Lexus and Audi. The Telluride isn't the only latecomer to the three-row circus. Its platform mate, Hyundai's Palisade, is due up soon, as are the new XT6 from Cadillac and Lincoln's Aviator. Still more are arriving in SUV segments, including three-row Jeeps and Rivian's all-electric entry. They'll all have to contend with newcomers such as the Subaru Ascent, Volkswagen Atlas and Lexus RX L. Together with incumbents such as the Honda Pilot, Toyota Highlander, Nissan Pathfinder, Chevy Traverse, GMC Acadia, Buick Enclave, Mazda CX-9 and the newly redesigned Ford Explorer, they make three-row crossovers one of the most competitive categories in the industry — and an increasingly diverse one, with varying designs, price points and powertrains, including hybrids and plug-ins. The marketplace appears ready to absorb the new product. Fuel prices are low. U.S. sales of large crossovers rose 11 percent to 935,337 last year as more families graduated out of cars and minivans. Minivans managed just over half that volume. Three-row large and midsize crossovers remain among the most profitable light-truck segments, prized for their ability to play the roles of minivan, truck and luxury vehicle all in one. For Hyundai and Kia especially, they offer an important way to keep car owners brand-loyal as their families and needs grow. But for those former car and minivan buyers, affordability of large crossovers could be an issue down the line, and some analysts wonder whether the segment could suffer a competitive squeeze if the economy slows. Brian Moody, executive editor of Autotrader, thinks $35,000 is a good base price for the segment, although he added that consumers who want amenities such as leather trimmings and sunroofs will have to drop more than $40,000 in most cases. The luxury contenders, meanwhile, start in the mid-$40,000s. "I think that if manufacturers can make their mark and make the right combinations, the survivors are going to quickly rise to the top," Moody told Automotive News. "But eventually, years down the road, you're going to come to a conclusion that we can't have all of these conversations about [affordability] and then say, let's make more big, expensive cars." It’s hard to be too quirky with a three-row utility vehicle, but the segment is beginning to see more subtle differentiation, just as minivan makers sought to distinguish their boxy family haulers with unique seating configurations and family-friendly features. Honda is bullish on its eight-seat Pilot, which was freshened for the 2019 model year and had a 25 percent jump in U.S. sales last year. Honda added a series of features to the latest Pilot that were previously in its Odyssey minivan, including wireless phone charging, 4G LTE Wi-Fi and an upgraded digital interface. Kia hopes to stand out from the bunch with a Telluride design that harks back to the "big, bold and boxy" truck-based SUVs of old. "A lot of SUVs and CUVs these days are trying to look super sporty, super sleek, super low [with] a lot angles," Kearns, chief designer at Kia Design Center America in Irvine, Calif., told Automotive News. "We felt our market could appreciate something with a little more straightforward SUV look with a longer hood and more upright windshield." Consumer awareness could be an early hurdle for the Palisade and Telluride, both new nameplates. But Hyundai and Kia could find an accessible audience among the customer bases they built with economical entry-level cars during the Great Recession and recovery years, said Jeremy Acevedo, Edmunds' manager of industry analysis. "You think about millennials and people who have grown with the Kia brand or Hyundai brand," Acevedo said. "People who may have gotten into the brand a few years ago who may be starting families now." On the luxury side, the 2020 XT6 will offer Cadillac customers a step between the midsize XT5 and the giant, truck-based Escalade. For Lincoln, the Aviator will provide a three-row option below the Navigator, which, at $74,000-plus, is out of reach for many consumers. While the luxury three-row category evolves, a pioneer in the segment is feeling pressure. The Acura MDX, which appeared in 2000, is still a workhorse for the brand, but sales were down 6.1 percent in 2018 to 51,512. Acura has freshened the design in recent years with its diamond pentagon grille and introduced the sportier A-Spec appearance package on the 2019 model. "It's a benchmark. I'm sure when you go into r&d anywhere, they're going to have one sitting in the studio somewhere," said Jon Ikeda, Acura's vice president. "It's a constant challenge for us to re-look at it and re-evaluate it." Hannah Lutz and Michael Wayland contributed to this report.